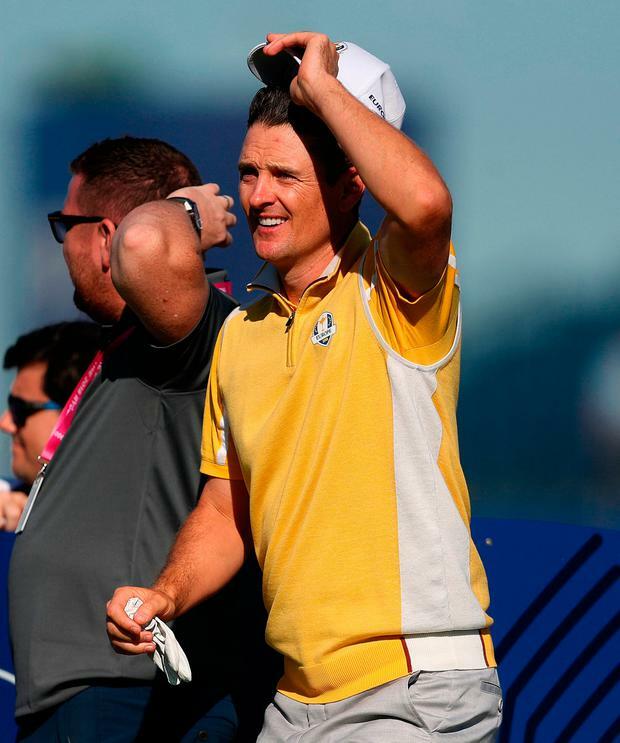 Justin Rose was handed the task of leading Europe's bid to win the Ryder Cup for the third contest in succession as Ian Poulter was left out of the opening session in Paris. Rose, who won $10m on Sunday by claiming the FedEx Cup title in Atlanta, partnered Henrik Stenson in the first match at Gleneagles in 2014 and at Hazeltine two years ago. But the Olympic champion was handed a new partner in Spain's Jon Rahm for today's opening fourballs match at Le Golf National as Europe look to regain the trophy. Ireland's Rory McIlroy will be next out when he and Dane Thorbjorn Olesen take on world number one Dustin Johnson and Rickie Fowler. Rose and Rahm will take on three-time major winner Brooks Koepka and wild card Tony Finau. The pairing of Paul Casey and Tyrrell Hatton then have the daunting task of taking on Jordan Spieth and Justin Thomas, with Tommy Fleetwood and Francesco Molinari having an equally tough task against 'Captain America' Patrick Reed and a rejuvenated Tiger Woods. Woods claimed the Tour Championship last Sunday for his first tournament win since August 2013 and his 80th PGA Tour title. The 42-year-old languished as low as 1,199 in golf's world rankings less than a year ago following spinal fusion surgery, but completed a remarkable comeback at East Lake. Woods has been on the winning side just once in seven previous appearances and has lost 17 of his 33 matches, but there was no place in the opening session for Europe's Ryder Cup talisman Poulter, who has won 13 points from his 18 matches and was one of captain Thomas Bjorn's four wild cards. Bjorn expressed his pride at leading the team during the opening ceremony and although he did not specifically reference Brexit, the Dane appeared to make a pointed reference to the situation. "This great continent can at times be a fragmented place, but when it comes to the Ryder Cup it's different. When it comes to the Ryder Cup Europe stands as one," Bjorn said. "We will play with passion, we will play with commitment and we will play with pride, but more than anything else this week we will play for that flag." Despite starting three rookies, Bjorn refused to confirm whether every member of his team would play on the opening day. "I have got my plans in my head as to what I want to do but you have to be aware they move," he added. "This is an opportunity to stand up and follow in the footsteps of the great players of this continent. "Players are counted for what they do in the greatest events in the world but legends are made in the Ryder Cup." USA captain Jim Furyk admitted he faced some difficult decisions in selecting his first eight players. "The hard part is telling guys, 'I'm going to rest you in the morning'. I feel we have a team of 12 guys playing well," he said. "Just because a guy is not playing in the first match there's nothing to say he won't play in the next three." The USA captain played down the significance of benching Ryder Cup veteran Mickelson for the opening morning. "Phil is 100 per cent on board. It is special for him to have the opportunity at 48 years old and he wants what is best for the team," Furyk said. "We had a great conversation. We feel great about the team and he feels good about his game too. I have a lot of confidence in Phil." Meanwhile, Paul Casey has revealed that he is determined to make the most of what could be his last Ryder Cup on home soil after a decade on the sidelines. Casey was part of the European teams which won by record margins in 2004 and 2006, as well as the defeat at Valhalla in 2008, but was controversially overlooked for a wild card by Colin Montgomerie in 2010 despite being ranked ninth in the world at the time. The 41-year-old admits he was not playing well enough to be considered for a place in 2012 and 2014 and was ineligible in 2016 after giving up his European Tour membership in order to concentrate on getting back inside the world's top 50. But that move paid off in style and the world number 21 held off Woods to win his first PGA Tour title since 2009 in the Valspar Championship in March, the kind of form which earned him a wild card from Bjorn. "I made the decision to rejoin the Tour almost two years ago and so to be sitting here now is very satisfying, very enjoyable," Casey said. "It was obviously the goal to make that team and now the goal is to win points, which I believe I can do, and I'm super excited for this week. "I think I've got more of an appreciation this time around. I've taken notes this week and tried to really pay attention to how special this is. "I don't have a diary, but I'm just standing back and making sure I absorb this. Ryder Cups in the past have gone so quickly and I just want to make sure I remember this. "At 41 I don't know how many opportunities I'm going to get to play another European-based Ryder Cup. I don't want this to be my last, but plain and simple, at 41, it's got a chance that it is. "So I just want to make sure that I pay attention to it and enjoy it, deliver points, play my heart out, but enjoy it at the same time."